God save us all from people who do the morally right thing. It's always the rest of us who get broken in half. I think we all have a little voice inside us that will guide us. It may be God, I don't know. But I think that if we shut out all the noise and clutter from our lives and listen to that voice, it will tell us the right thing to do. Integrity is doing the right thing, even if nobody is watching. 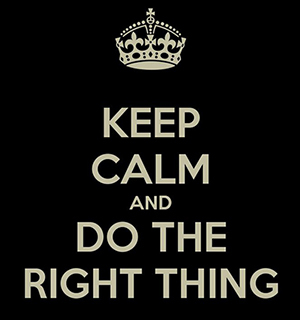 Never do the correct thing when you can do the right thing instead. No one owns being good. I'm good. I just don't believe I'll be rewarded for it in heaven. My reward is here and now. It's knowing that I try to do the right thing. That I lived a good life. The right things sometimes happen for the wrong reasons. The way you solve things is by making it politically profitable for the wrong people to do the right thing. Time moves funny and it's hard to pin down. Occasionally, time offers you a hundred opportunities to do the right thing. Sometimes, it gives you only one chance. We must recognize the full human equality of all of our people before God, before the law, and in the councils of government. We must do this, not because it is economically advantageous, although it is; not because the laws of God command it, although they do; not because people in other lands wish it so. We must do it for the single and fundamental reason that it is the right thing to do. You don't have to think about doing the right thing. If you're for the right thing, then you do it without thinking.